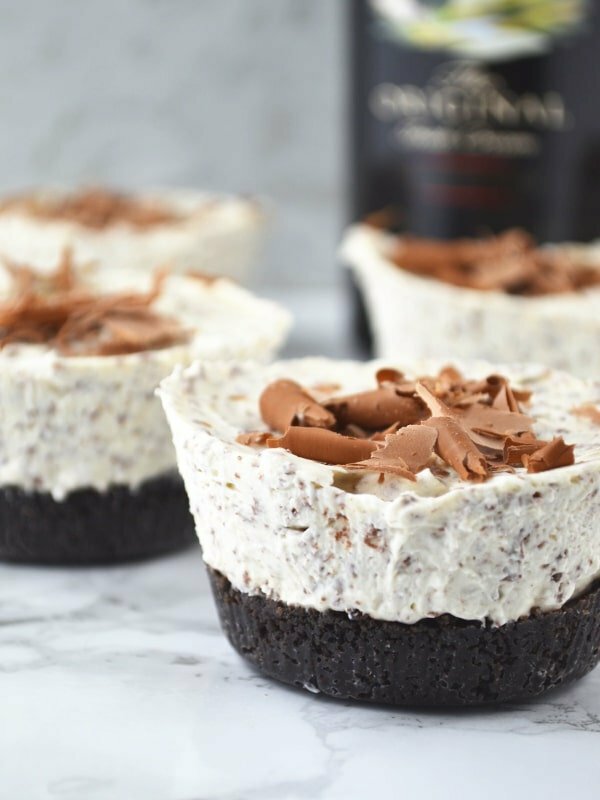 These Boozy Baileys Mini Cheesecakes are so easy to make and are the perfect festive party food, they’ll be gone in no time! This time of the year is all about celebrations, parties, flowing glasses of Prosecco and indulgent little bites. Making party food is so fun and easy, I basically just think of my favourite dishes and make them in miniature form. Prawn cocktail, stuffing ball bites, pigs in blankets and these Boozy Baileys Mini Cheesecakes. These mini cheesecakes are so easy to make, there’s hardly any work involved, they taste incredible and give an extra special touch to any party spread. I used individual foil muffin cases that I bought from the supermarket to make these cheesecakes. The foil cases give a nice smooth edge however regular muffin cases work just as good and are a little easier to unwrap. You can also use a mini cheesecake mould that has removable bottoms if you have that, they work perfectly. 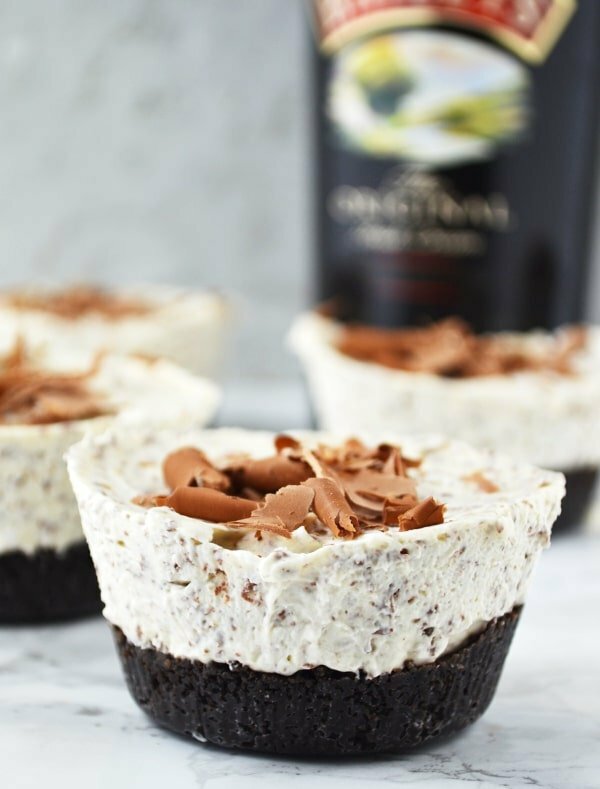 To make these yummy Boozy Baileys Mini Cheesecakes I first of all crush Oreo biscuits in a food processor until they resemble very fine breadcrumbs. I add them to melted butter and mix it all together. The Oreo base is then pressed into the muffin cases and left to set in the fridge for one hour. To make the filling I simply whip together some cream cheese, icing (powder) sugar, Irish cream liqueur and grated chocolate. I then fold in some whipped cream which makes it light and delicious before filling each muffin case with the topping. They are then placed in the fridge for at least 2-3 hours and that’s it! Don’t forget to leave me a comment if you enjoyed this recipe or just want to say hi! You can also follow me on FACEBOOK, TWITTER, INSTAGRAM and PINTEREST to see what I’m up to. Roughly break the Oreo biscuits into a food processor. Blitz the biscuits on a high speed until they resemble fine breadcrumbs. Melt the butter in a saucepan then add the biscuit crumbs and mix until it's thoroughly combined. Divide the biscuits between 9 muffin cases and press down with the back of a teaspoon to form a base, refrigerate for 1 hour. To make the filling add the cream cheese, Irish cream liqueur, icing sugar, chocolate in a large bowl and lightly whip together. Fold in the whipped cream until thoroughly combined. Divide the mixture into the muffin cases and refrigerate for at least 2-3 hours. To serve simply remove from the muffin cases and sprinkle over a little extra grated chocolate. Takes 10 minutes prep time plus 5 hours chilling. Please note this recipe was developed and tested using metric measurements all imperial measurements are an approximate. Hi Patricia, you can use any kind you like for this recipe. These look wonderful. Is double whipping cream the same as heavy whipping cream? Also is icing sugar powder sugar? I want to make for my Bunco group. Hi Linda, yes double cream is the same as heavy cream and icing sugar is powder sugar. Hope you enjoy them! When you whip the cream, do you add sugar? Hi, no I don’t add sugar to the cream. I whip it then fold it into the cream cheese mixture. These look scrumptious! What’s the trick to getting them out of the muffin tin without wrecking them? Hi Suzanne, you’ll need to use muffin cases or small tin foil cases that you would normally see mince pies in at Christmas time. I’m not sure if you can get them where you are but normal muffin cases work great, then you can just peel the cases off when you’re ready to serve them. Thanks so much! wow this looks amazing, I am such a fan of cheesecake I bet I could make my own version with cashews and coconut milk and add some baileys inspired drink. I don’t do dairy so I do have to make adjustments. You definitely could that sounds so yummy! I’m a big fan of cheese cakes and I’m sure your recipe will be no different. I’ll probably will keep going for more and more. These look so tempting. I adore the combination of Bailys and chocolate! I love your recipes, however could you please use regular measurements with your recipes. Hey Audrey, I’m from the UK and we use metric measurements (grams, ml etc) however I’ll definitely look into providing a converter on all my recipes to make it easier for you in the future, thanks for reaching out I’m always looking to improve the blog for my readers. Do you take out the white inside of the Oreo and only use the biscuit for the base? 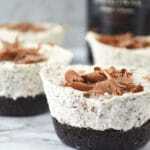 These mini cheesecakes are so much fun and they look delicious!! Thank you so much, they’re so easy to make too! Well, this could be an issue for my jeans! 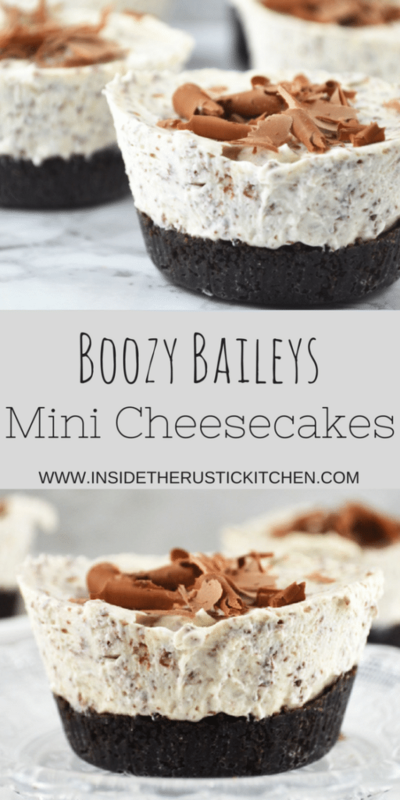 These mini cheesecakes has everything I love – lots of cream and cheese, and a booze 😀 Emily, these mini heavens looks really delicious. Sharing this and saving to try 😉 Cheers! Thank you so much Natalie, I hope you enjoy them! Those are beautiful little bites that I’m keeping for a special day! I love Baileys. Boozy AND easy to make?! Heck yeah – these are my kinda Christmas desserts! Gotta love the boozy desserts at Christmas lol, thank you Shashi! Yuuuuum! 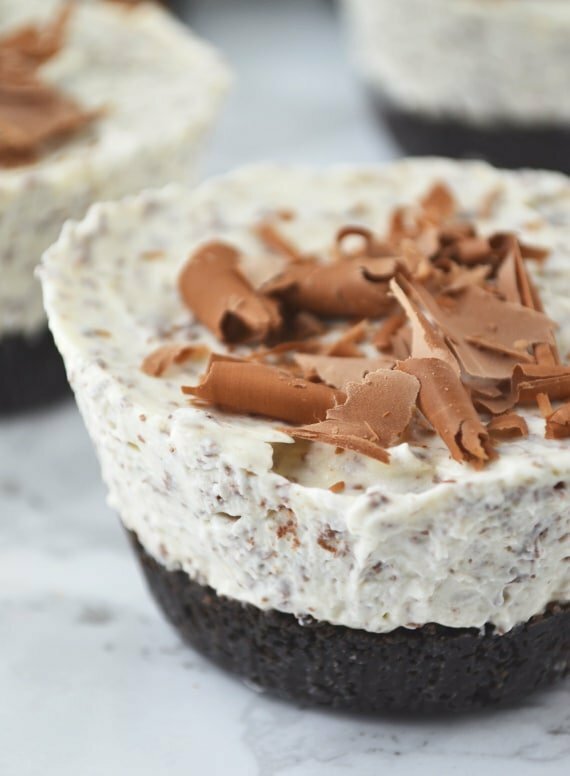 I love that you used Oreos for the crust of these. They look amazing. Thank you Becca, the crust is SO good! My husband would LOVE these and I think they might have to be our Christmas dessert this year. Perfect for party food too. Aww thank you so much, they are perfect for Christmas!